Many have asked why the MFZTA does not support non-resident trapping. One only needs to look at the map above to understand why and then consider the following . 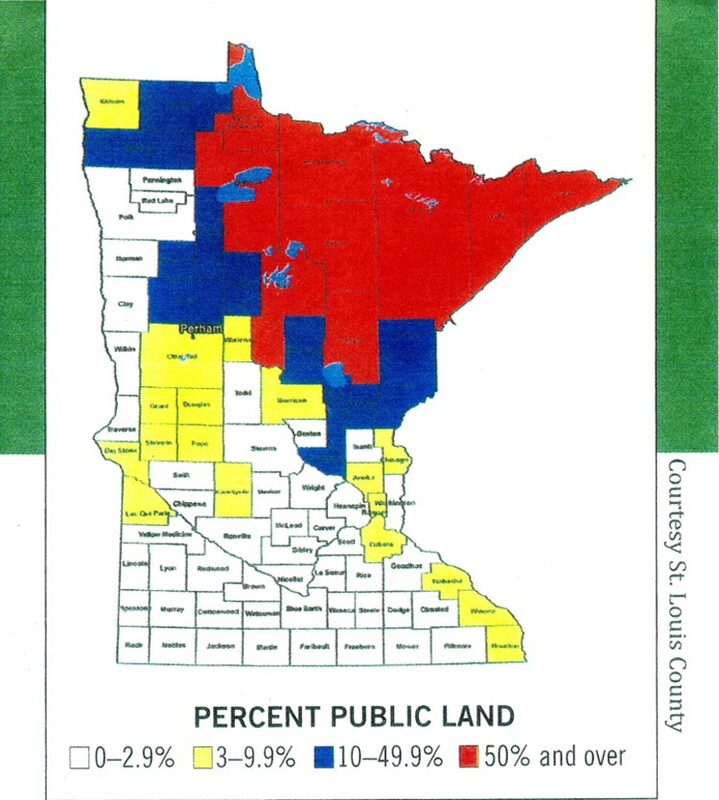 There are eight million acres of public land in the State of Minnesota. The above map represents where these lands exist in the state and as you can see 95% of all public lands exist in the boundaries of the MFZTA. Within the MFZTA Boundaries we are blessed to have every known Minnesota furbearing animal. In addition we have populated and/or repopulated many states as well as our own. The otter for example now populates the entire state which is a direct result of management practices designed or by accident. One hundred thirty five marten have been live trapped and sent to Wisconsin in the past five years, in an attempt to repopulate that state for the second time. The MFZTA believes that non-resident trapping will put an unwarranted strain on Minnesota's furbearing animals. Many proponents supporting non-resident trapping are those that moved to Minnesota from other states and now wish to return to their home state to trap. Unfortunately they didn't feel it necessary to buy a lifetime license in their state before moving to Minnesota. This simple act would have solved their dilemma but may have cost them a couple hundred dollars. These same people are willing to sacrifice the bounty of our state and 95% of all public land for their own selfish interest. These same individuals and some other supporters say we are the selfish ones since we want all the animals for ourselves. Nothing could be further from the truth. Very frankly in the lower forty eight states, Minnesota remains the last standing state and the only hope of assuring that we will continue to have an abundant furbearer population well into the future. Other examples would be the wolf, fisher and even the bald eagle which all came from within the boundaries of the MFZTA. Less than ten years ago the State of Minnesota, the Safari Club International and the Minnesota Trappers Association fought off a challenge to end trapping in the state. (Two MFZTA board members were part of that) This became known as the Lynx Lawsuit and as a result the entire arrowhead region of the state (everything east of hwy #53 from Duluth to International Falls) was declared the Lynx Habitat Zone, complete with additional trapping restrictions. In addition these three groups spent nearly $500,000 defending our right to trap. To the supporters of non-resident trapping we ask the following: Do you seriously want to open the state to someone who knows or cares nothing about our history or struggles and then have them reopen the Lynx lawsuit again by catching another Lynx? Who will pay for that lawsuit, the non-resident or the Minnesota trappers and taxpayers? The MFZTA believes in Minnesota Exceptionalism and will defend our right to excel at it.